The Nested24 procedure in code 1, constructs a demonstration nested IF formula with 23 nesting levels. Code 1 line 6 assigns an Excel formula as a string to the Formula variable. 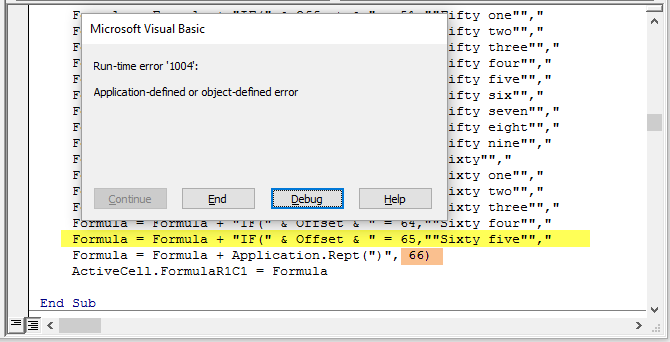 The Formula string is 603 characters in length and you need to horizontally scroll to view the complete string in the editor. The entire line 6 forms the logical line of the code statement which assigns the string to the Formula variable. Although it does not effect operation of the code, the logical line can be broken into a number of physical lines to improve readability in the editor. This process is called line continuation. The b>code 1 formula is shown in figure 1. 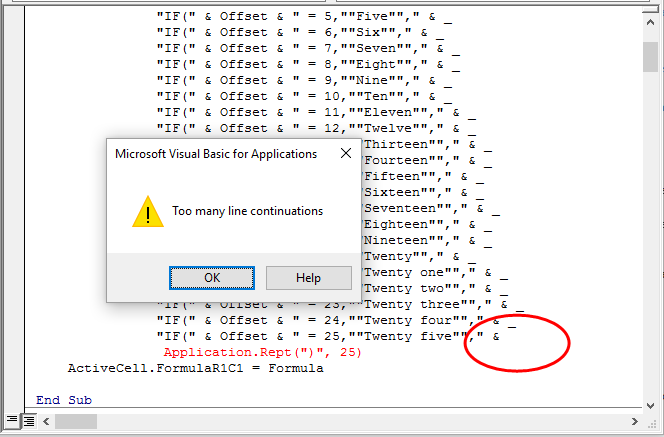 Note that the line continuation (line break) only applies to the code, not the output in the Excel formula bar. As can be seen, code 2 is easier to read, than the format of code 1. What was one line, is now spread across 25 lines (line 7 to line 31) in code 2. There are 24 consecutive line-continuation characters. In VBA, there is a limit on the number of consecutive line-continuation sequences. Adding one line-continuation to code 2 returns the error shown in figure 2. The editor prevents entry of the 25th underscore. Thus, the limit is 24 line-continuation characters. Line-continuations are frequently used with string variables. Another way to break lines for improved readability, and also overcome the 24 line-continuation limit is to use concatenation and build the string in a number of steps. To illustrate this, the Nested24 procedure is extended to a Nested64 procedure. A secondary motivation here, is to illustrate the limit of nested functions. Note: in VBA the catenation operator can be the ampersand (&) character or the plus (+) character. Formula = "=IF(" & Offset & " = 0,""Zero"","
Formula = Formula + "IF(" & Offset & " = 1,""One"", "
Formula = Formula + "IF(" & Offset & " = 2,""Two"", "
Formula = Formula + "IF(" & Offset & " = 3,""Three"","
Formula = Formula + "IF(" & Offset & " = 4,""Four"","
Formula = Formula + "IF(" & Offset & " = 5,""Five"","
Formula = Formula + "IF(" & Offset & " = 6,""Six"","
Formula = Formula + "IF(" & Offset & " = 7,""Seven"","
Formula = Formula + "IF(" & Offset & " = 8,""Eight"","
Formula = Formula + "IF(" & Offset & " = 9,""Nine"","
Formula = Formula + "IF(" & Offset & " = 10,""Ten"","
Formula = Formula + "IF(" & Offset & " = 11,""Eleven"","
Formula = Formula + "IF(" & Offset & " = 12,""Twelve"","
Formula = Formula + "IF(" & Offset & " = 13,""Thirteen"","
Formula = Formula + "IF(" & Offset & " = 14,""Fourteen"","
Formula = Formula + "IF(" & Offset & " = 15,""Fifteen"","
Formula = Formula + "IF(" & Offset & " = 16,""Sixteen"","
Formula = Formula + "IF(" & Offset & " = 17,""Seventeen"","
Formula = Formula + "IF(" & Offset & " = 18,""Eighteen"","
Formula = Formula + "IF(" & Offset & " = 19,""Nineteen"","
Formula = Formula + "IF(" & Offset & " = 20,""Twenty"","
Formula = Formula + "IF(" & Offset & " = 21,""Twenty one"","
Formula = Formula + "IF(" & Offset & " = 22,""Twenty two"","
Formula = Formula + "IF(" & Offset & " = 23,""Twenty three"","
Formula = Formula + "IF(" & Offset & " = 24,""Twenty four"","
Formula = Formula + "IF(" & Offset & " = 25,""Twenty five"","
Formula = Formula + "IF(" & Offset & " = 26,""Twenty six"","
Formula = Formula + "IF(" & Offset & " = 27,""Twenty seven"","
Formula = Formula + "IF(" & Offset & " = 28,""Twenty eight"","
Formula = Formula + "IF(" & Offset & " = 29,""Twenty nine"","
Formula = Formula + "IF(" & Offset & " = 30,""Thirty"","
Formula = Formula + "IF(" & Offset & " = 31,""Thirty one"","
Formula = Formula + "IF(" & Offset & " = 32,""Thirty two"","
Formula = Formula + "IF(" & Offset & " = 33,""Thirty three"","
Formula = Formula + "IF(" & Offset & " = 34,""Thirty four"","
Formula = Formula + "IF(" & Offset & " = 35,""Thirty five"","
Formula = Formula + "IF(" & Offset & " = 36,""Thirty six"","
Formula = Formula + "IF(" & Offset & " = 37,""Thirty seven"","
Formula = Formula + "IF(" & Offset & " = 38,""Thirty eight"","
Formula = Formula + "IF(" & Offset & " = 39,""Thirty nine"","
Formula = Formula + "IF(" & Offset & " = 40,""Forty"","
Formula = Formula + "IF(" & Offset & " = 41,""Forty one"","
Formula = Formula + "IF(" & Offset & " = 42,""Forty two"","
Formula = Formula + "IF(" & Offset & " = 43,""Forty three"","
Formula = Formula + "IF(" & Offset & " = 44,""Forty four"","
Formula = Formula + "IF(" & Offset & " = 45,""Forty five"","
Formula = Formula + "IF(" & Offset & " = 46,""Forty six"","
Formula = Formula + "IF(" & Offset & " = 47,""Forty seven"","
Formula = Formula + "IF(" & Offset & " = 48,""Forty eight"","
Formula = Formula + "IF(" & Offset & " = 49,""Forty nine"","
Formula = Formula + "IF(" & Offset & " = 50,""Fifty"","
Formula = Formula + "IF(" & Offset & " = 51,""Fifty one"","
Formula = Formula + "IF(" & Offset & " = 52,""Fifty two"","
Formula = Formula + "IF(" & Offset & " = 53,""Fifty three"","
Formula = Formula + "IF(" & Offset & " = 54,""Fifty four"","
Formula = Formula + "IF(" & Offset & " = 55,""Fifty five"","
Formula = Formula + "IF(" & Offset & " = 56,""Fifty six"","
Formula = Formula + "IF(" & Offset & " = 57,""Fifty seven"","
Formula = Formula + "IF(" & Offset & " = 58,""Fifty eight"","
Formula = Formula + "IF(" & Offset & " = 59,""Fifty nine"","
Formula = Formula + "IF(" & Offset & " = 60,""Sixty"","
Formula = Formula + "IF(" & Offset & " = 61,""Sixty one"","
Formula = Formula + "IF(" & Offset & " = 62,""Sixty two"","
Formula = Formula + "IF(" & Offset & " = 63,""Sixty three"","
Formula = Formula + "IF(" & Offset & " = 64,""Sixty four"","
The code 3 formula is shown in figure 3. Adding one more nesting level to code 3 returns the run-time error shown in figure 4. The A1=65 (shown by the yellow highlight), and 66 closing brackets (orange highlight) exceed the Excel 64 nesting level limit.